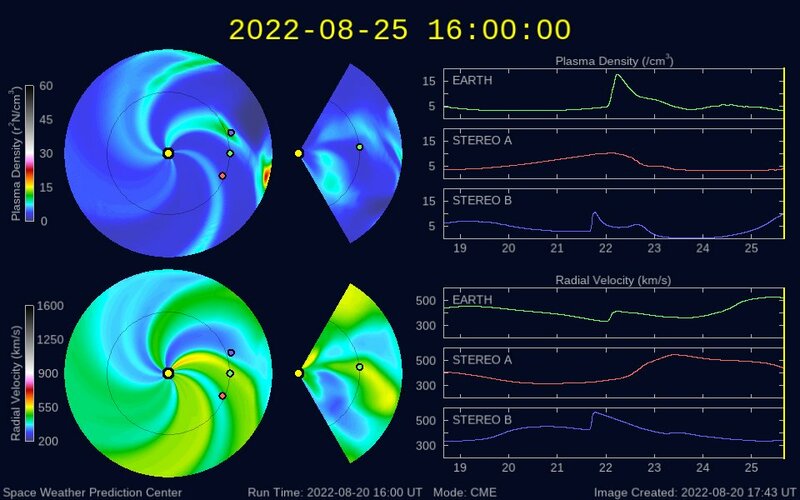 The solar wind weakens. The number of neutrons in Oulu exceeds 6500. I’m on a new file now. Like I explained: The investigation is finished. America went too far. This is now in the hands of the higher ups. Correction will come from Asia. The study always looked like a ploy to gloss over inconvenient climate data prior to the Paris climate con…ference. What’s an ‘official temperature trend’? One that you have to mop the fevered brow of? OB it’s too late for any of that too matter. All it does is prove to the higher ups that westerners are ignorant &/or deceptive. I know this is upsetting, but the matter is now out of our hands and correction will come from the East. 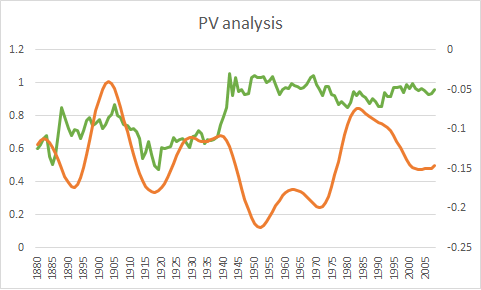 PV: Is that data correction or some other kind of correction – or both? The strength of the galactic radiation depends inversely on the solar wind. I’m one of the signatories on that letter. We need to get to the bottom of the everchanging data debacle. I know how to subtract 1 column of numbers from another. …and therefore I easily see what NOAA did wrong. Recommendation for honest, competent parties genuinely and seriously concerned with integrity: Independently understand simple #2 firsthand by subtracting one column of numbers from another. The formula’s written on the graph. It says: Put ICOADS SST2.5 in one column and HadNMAT2 in another. Subtract one from the other and compare with IPO. Notice that the “bias” “corrections” match a natural pattern (the IPO). Diagnosing and understanding the impact of the vandalism on the other patterns (1, 3, & 4) demands advanced awareness and skill, but #2 can be used as a simple black-&-white test of integrity. Observing who refuses to acknowledge #2 firsthand decisively maps out unbelievable (that’s the key word because it’s literally unbelievable) incompetence and/or sketchy/shady corruption in the climate discussion community. It’s a perfect test exactly because it’s evasion-proof dead-simple black-&-white. No one can look good claiming to be unable to subtract ICOADS SST2.5 from HadNMAT2 all by themselves. Anyone who tries to pretend they can’t do it is immediately suspected of lying and if someone really can’t do it, why (?!) would they want to draw attention to that very unflattering fact??? Trust in the existence of fair judging is fatally razed either way. BOTH noaa & their American critics are absolutely conclusively guilty on this file. This is going to upset people, but with such outrageous, unchecked corruption in plain view I would say the time has come that it needs to be said: Every day I respect China more and America less. What do I really think is going on? “The central US climate blogs are actively supporting the corruption at noaa by showcasing deliberately weak criticism. ” – is purely unproven crap that doesn’t advance your point. Basically Paul is convicting people because they don’t do what Paul expects, because they don’t understand him, although he didn’t explain himself for a year. Who is the responsible party here? The time for teasing everyone to see who ‘gets it’ was over a year ago. This article has barely advanced this matter beyond the suggestions page because who can read Paul’s mind? What can Lamar Smith do with information put together without data links for each graphic, that’s short on explanation, yet with several comments with invective & insult by it’s author? How do you think your comments should be seen by Smith relative to those of skeptics who signed the Quality Data Act letter – should he take your dark accusations of them to heart and dismiss their petition because they’re not as good as you or something? Is there some kind of resistance here preventing the writing of a rather dry, detailed, but informative letter that fleshes out all the reasons why this should garner Rep. Smith’s and the public’s attention? I’ll remind again that there’s not much talking about this subject going on here, because in truth, Vaughan the Vague isn’t saying enough about it for people to really have an opinion. Get an idea what things look like from the outside. Example: what would it look from here if someone spent most of his time in WUWT’s suggestion pages tossing insults and innuendo across the Atlantic at the Talkshop? That would be a worldwide joke. The one thing seen at WUWT occasionally, are comments to Anthony telling him the lead article was poorly written or unsubstantiated. If that’s never happened here, let me be the first. Roger, Paul’s article sucked. Rog just blogged a comment I made. Lamar Smith: You won’t be able to win the case if you don’t fully understand how ridiculously simple this is. This is a smoking gun. The other stuff is a long list of minutia by comparison. Even in aggregate it looks frivolous and it is sure to be dismissed as such by a sensible judge. Never mind trying to understand #1, #3, & #4. That’s way too advanced for simple folks. #2 on the other hand is a simple smoking gun. NO other info is needed to reproduce #2. I caution you to regard with deep suspicion anyone suggesting otherwise to you. You can use this as a failsafe test of who’s competent (at the ever-so-difficult task of subtracting one column of numbers from another) & trustworthy. This is getting totally ridiculous. With due seriousness: I recommend firing anyone who can’t complete the task in 5 minutes. As any moron can see: NOAA’s “bias” “corrections” track a natural feature of climate: the IPO. 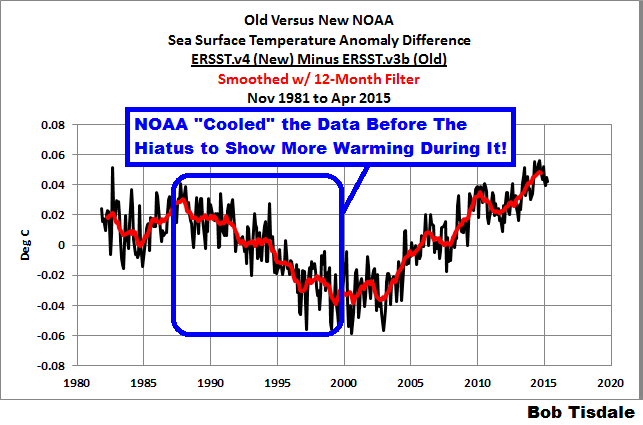 This means NOAA regards a natural feature of climate as a “bias” that needs to be “corrected” out of the record. More advanced diagnostics tell more about the impact of the “bias” “corrections” on recorded spatiatemporal pattern (e.g. graphics above comments section), but the details are way too far beyond accessible for the average reader and so I’m suggesting focus on just THE SIMPLEST AND (BY ORDERS OF MAGNITUDE) MOST POWERFUL feature of the “bias” “corrections” that is easily within the reach of every reader capable of subtracting one column of numbers from another to see FIRSTHAND that NOAA considers a natural feature of climate (IPO) to be “bias” that needs to be “corrected” out of the record, giving for example the KINK Bob Tisdale illustrated (last graph immediately above). Cut and paste to Excel. Put the years on the x-axis of a graph and columns 4 & 6 on the y-axis. Subtraction was too hard — even with 6 months to do it(!) — so let’s see how people fare with copying/pasting and graphing. Not expecting any acknowledgement or understanding — only expecting further proof of corruption… I dare anyone to prove this suspicion wrong!! NOAA: Ripping nature OUT of the record. Lamar Smith: Throwing this in NOAA’s face with absolutely rock solid confidence is your nuclear option, but I suggest giving them avenue to save face: Let them retract v4 and go back to v3b2 for whatever reason they want to project. What matters is not toasting and roasting them, but rather keeping the record of natural beauty in tact. Please: I’m suggesting we stay vigilantly focused on that top priority. I recommend this sort of protective mindset: We are the defenders of natural beauty and NOAA don’t you dare think of defacing and vandalizing natural beauty. It’s a clean good image backed up by absolutely rock solid simple facts that can be made understandable to every Jane & Joe even if their math is only grade 4 level. I can walk a 4 year old through the subtraction, copying/pasting, and graphing. v4 needs to be retracted, but noaa doesn’t need to be convicted if they cooperate with good judges on retracting the violation of natural beauty. Come on people: WAKE UP. Look at the kinks in 1990 & 2000 (on both Bob’s graph & the IPO “bias” “correction” graph). Paul, thanks for supplying the data. Here’s what I get following your cookbook instructions. Will I find anything in it that explains this? Are there no more data from KNMI after 2008? I’ve been browsing through their time series and fields and haven’t found the relevant datasets yet. Further hints appreciated. Will I find anything that explains this? Compare column 3 (ICOADS2.5SST-HadNMAT2) with column 5 (IPO). (something I’ve pointed out countless times for a full year). In phase after the step. …so if you FLIP OVER (that’s what the negative sign does) the anti-phase stuff BEFORE THE STEP, you’ll have an in phase relationship for the whole record. Once I’m confident that more than say 2 dozen people FINALLY understand, we can discuss interpretation at the next level …so please Roger: Please QUICKLY get more than 2 dozen people on board here understanding that the “bias” “corrections” match the IPO in full public view. Once that is accomplished it will BECOME (it isn’t yet) worthwhile to discuss interpretation at the next level. First thing first. SEQUENCE matters. The higher ups are watching and I’ve now got the green light to reveal (and simplify) more after results are in from recent tests IF there’s a CLEAR demonstration that american thought police will NOT be allowed obstruct straightforward acknowledgement of “bias” “correction” concordance with IPO. This window of opportunity to launch a new era in relations will close, so I suggest making the best of it right now. TB, you should have the series clearly represented with a different color before and after 1941. This will be needed for interpretation at the next level. They won’t need any weather stations OB. They have a computer model. Paul: Please QUICKLY get more than 2 dozen people on board here understanding that the “bias” “corrections” match the IPO in full public view. Once that is accomplished it will BECOME (it isn’t yet) worthwhile to discuss interpretation at the next level. I stand ready to assist. It doesn’t take a luminary to subtract one column of numbers from another. This is a simple case. ANYONE AT ALL should be able to write the boring letter you want. That’s not my role. Of course, but the fig leaf of respectability would be the data from the weather station. TB: I’ll never be doing any of that stuff you list. That’s not my role. 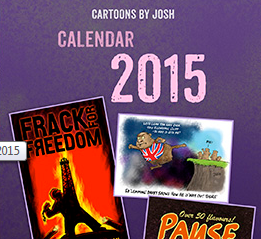 Isn’t this what the man-made-climate-change-global-warming malarkey is all about? Getting rid of anything that smacks of natural variation then announcing that man is corrupting the climate. We’ve seen it with things like the Medieval Warm Period, sunspot records…you name it, they’ve tried it, and they’ll keep on trying it as long as politicians are backing them. Paul: It doesn’t take a luminary to subtract one column of numbers from another. This is a simple case. What, in the NOAA paper, indicates that this is what they actually did? Actually, they would have had to do more than that, with the switch in which column is subtracted from the other at 1940, and adding/subtracting the constant which matches up the adjacent values. How would I convince Lamar Smith that’s what NOAA did? Or are you saying that’s the effect of whatever they did? (weaker case). 1. Exploration should be free-spirited. 2. An administrative platform is not inspiring …at all. 3. Exploration takes precedence over communication. 4. Key pieces of information should be conveyed as concisely as possible. 5. Communication should be informal. 6. Anything that makes exploration & communication onerous (killing joy) should be promptly discarded. 7. One should not worry about reaching the masses. Reaching a few luminaries is sufficient. 8. Exploration can discover without meeting an administrator’s definition of science. My usual example is that all through my childhood I discovered forest trails, lakes, fields, swamps, brooks, etc. …and never did I ever think of it as science …and never did I write it up …but on countless occasions I did share my discoveries of natural beauty with others …and without ever following or even thinking about following any formal protocols. 9. This is aggressively managerial: The Pareto Principle should be applied devoutly & strictly. That’s probably neither an exhaustive nor perfectly expressed list, but in keeping with my philosophy I’m leaving it at that so there’s time for other pursuits. The case at hand is simple enough that someone else can write it up. It’s probably feasible for me to monitor this thread to efficiently coach while more people (should be at least 2 dozen within the next few days) wrap their heads around the calculations and next-level interpretations. As for framing up a more formal article: Everyone should know by now that they’re not going to get any support from me for that sort of thing, which I consider a total waste of my time. If others want to frame and write I respect that. Just give me crystal clear credit for the discovery upfront. More generally an efficient division of labor should be feasible. TB: Do you understand Figure 5’s relation to column 3? No. If they did diagnostics they would have effortlessly identified the blunder. The problem is that interpretation of multiple sets of conflicting data is very much in the eye of the beholder. Roger Andrews looked at NMAT vs SST a few years ago here at the talkshop and reached different conclusions. I can’t find the post just now, but I’ve emailed him to ask if he can remember it. So although it’s a clear-cut case in your opinion, we have to consider how well the case can be made to others. Looking at the data you provided, there must have been a sign exchange in the formula which translates the subtraction of the columns. I spotted that when I added the final two years of data you provided. I have browsed through KNMI and I cannot find the datasets. I know you say it’s only 5 minutes work, but I’ve already lost more than 30 looking for datasets you won’t directly link. I’m astonished at how onerous this is turning out to be. Dozens should have closed the case by now, even if we limit just to those who could not do the subtraction independently but could manage to copy/paste and graph. This is a terrible sign. There’s no way to link directly to KNMI Climate Explorer data. Go through the monthly observations link (over on the right). That’s one click. That’s all it takes to land on the page where HadNMAT2 & ICOADS2.5SST are listed. You won’t find any sign changes in the data. I put the sign change in there (note that I wrote it down clearly) to demonstrate the hidden symmetry. No automated linear algorithm will spot it, but it’s EASY for a human eye to spot. You’re completely missing the main point and I wish I didn’t have to point that out, but I had better do it bluntly because others will be misled if I don’t. Inspect a graph of column 3 vs. IPO. KNMI Climate Explorer links expire. I summarized the data in a table to save people this trouble. Some people love KNMI Climate Explorer, but I’ve noticed that others have trouble navigating it. Maybe what’s blinding people is the ensemble spaghetti they throw on ICOADS2.5SST-HadNMAT2 (column 3). Can you see that Figure 5 is spaghetti-ized column 3? So now you see the reflection symmetry. The negative sign flips over your green series. The 0.8 slides it vertically. Ask yourself why their “bias” “corrections” would match IPO ***at all*** — whether with this reflection symmetry or without it! — to clear your head of unnecessary confusion about the negative sign and 0.8 offset. They inflated IPO on one side of the step (jacking up variance). They deflated it on the other side (straightening the series). Given that this is the MAIN thing (by orders of magnitude) they’ve done, don’t you stop to wonder why there’s ABSOLUTE ZERO discussion of this in the paper????? You see? They don’t even realize they did it!! Measure the correlation before you do the reflection & alignment offset and again after. The comparison should make you realize what it looks like to automated diagnostic algorithms. It looks like NOTHING to a linear algorithm, BUT IT’S SYSTEMATIC. But if as you say V3b is “good” and V4 is a train wreck, shouldn’t we be looking at the residuals of a subtraction of those two series as well? And I’m not sure ‘reflection symmetry’ is going to cut any ice with chaos merchants anyway. Aren’t they going to invoke TOB’s biases or some such to explain the big step-up in 1939? 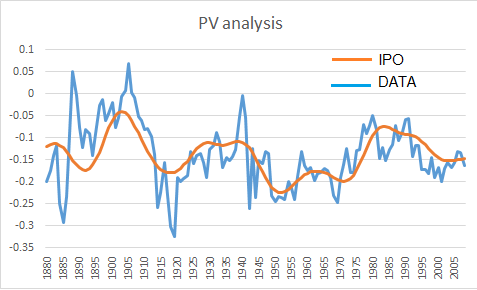 That’s why I chopped off my graph at 1890. Interpreting the graph before 1886 demands higher awareness. Everyone (I sure hope!) knows what the big step is. That’s not the issue here. v4 BY DEFINITION is based on the subtraction ICOADS2.5SST-HadNMAT2. THAT’S why we’re looking at ICOADS2.5SST-HadNMAT2. This case is absolutely perfect. If anyone questions it, it exposes distortion artistry with CRYSTAL clarity. Zero trust remaining. ZERO. Take it easy Paul, I’m just trying to understand the argument. And now I have to serve Sunday dinner. Back later. Remember that the v3b2 correction was just straight lines. Recall also that I checked and there’s NO statistical justification for NOT using straight lines. For v4 they’re overfitting the “bias” “corrections”. They’re overfitting them to the point where they’re chasing IPO (a natural feature). The only statistically significant thing needing correction is the big step. Chasing every bounce in the series is going WAY overboard. Like I said last year: I think they lost their better judgement because they got fond of the effect it had (straightening a part of the series they liked straightened). 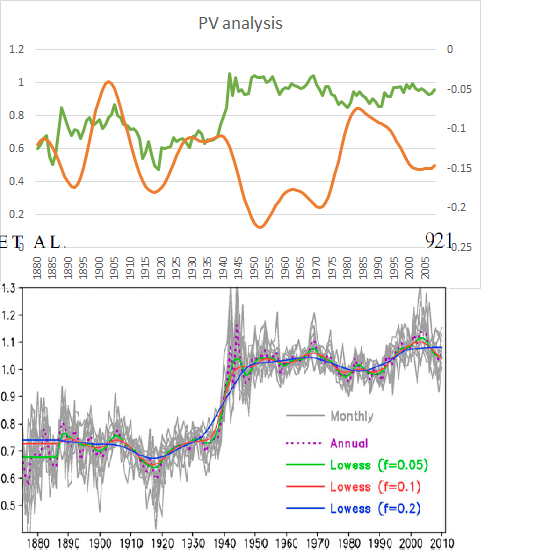 They convinced themselves that the lowess filter reduced the overfitting to a reasonable level, but they maybe never stopped to realize that smoothing ENSO gives you IPO. And then beyond that they just didn’t realize that the “biases” went in opposite directions either side of the big step relative to IPO. …so it was a double awareness failure. Like I said last year: They probably did the work in a rush. For SURE they should have noticed something this systematic. It’s EXTREMELY embarrassing. I doubt they could admit it honestly. It’s way too embarrassing. Their superiors would be SOOOOO choked. Technical Caution: Note on Figure 5 that the colored lines are all STRAIGHT before 1886. So ignore that part of all curves when interpreting the “bias” “correction” IPO relationship. Make sure you’re interpreting the reflection symmetry properly. It means the “biases” were in the opposite direction for the old vs. new SST measurements. They would have noticed the correlation if the sign didn’t flip. Automated diagnostics would miss the systematic sign flip at the big step. They’d measure near-zero correlation and miss the systematic pattern. Reflection symmetry is just the human eye’s diagnostic clue that automation failed. The pattern is too systematic. They can’t just shout it down. All that will do is expose extremely rude tactics. Make sure you understand fully just how egregious it is to deny something this simple and clear cut. It’s unforgivable. 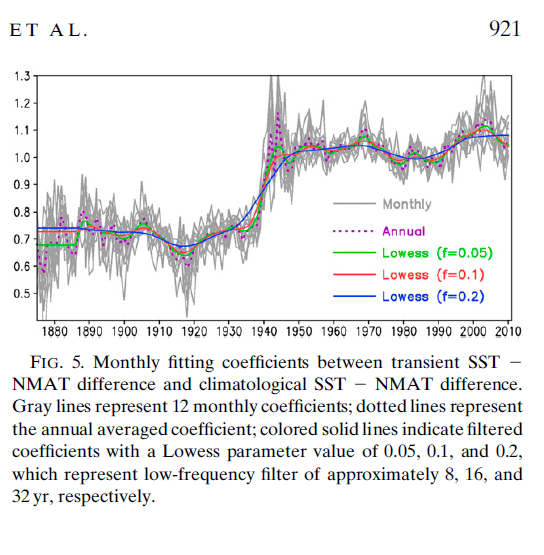 The “biases” are the difference between SST and NMAT, which changed sign through the C20th. So one of the questions we have to consider is whether the there might be a physical reason that could happen, or whether it reflects a bias in the measurement, not a change in Earth’s energy transfer profile. I hope we can find the post Roger Andrews did. I can’t remember whether he also analysed the hemisphere differences of the shifts in NMAT relative to SST north and south. Remembering the polar see-saw, we have to use geographically differentiated data to examine this possibility. You yourself have frequently insisted on this. Indeed, it appears in several of your plots at the top of this post. I already commented extensively on all of that a year ago. Keep in mind that IPO isn’t global, so what physical basis could there be for using it to correct “biases” uniformly? They didn’t use it. According to you they ended up with something approximating it by applying Lowess smoothing to spaghetti (if you reverse the differencing operation around 1940 and offset the data to splice it). I should probably read their paper before asking further questions. Roger Andrews was looking at something interesting, but it wasn’t v4. That was way before v4. v4 is defined by ICOADS2.5SST-HadNMAT2. Indeed you need to read the paper. They toss spaghetti around the core, but the core is still ICOADS2.5SST-HadNMAT2 by definition. For what reason would all “bias” “corrections” during measurement era B match IPO (including in places where there’s no IPO)? For what reason would all “bias” “corrections” during measurement era A match IPO (including in places where there’s no IPO)? You see it just doesn’t make any sense… It doesn’t make ANY sense. This exchange has been enlightening. I now understand why the discussions about this at wuwt are going backwards and moving forwards I won’t be discussing this with anyone who answers “no” when I ask if they’ve done extensive EOF analyses on both v3b2 & v4. 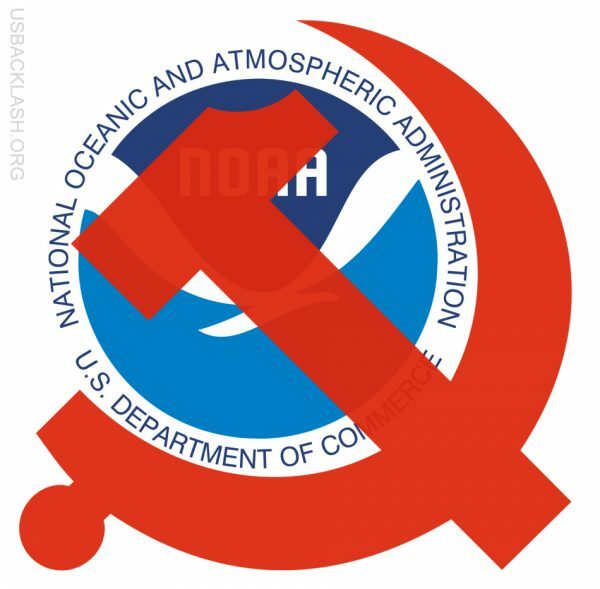 ‘NOAA has 16 USHCN stations in Maryland, but they have stopped collecting data from all but four of them. One of the disappearing stations is at Laurel, which has been collecting since 1895 – but no data reported since August 2015. In spite of all the badgering, I didn’t bother to look into this, I didn’t even try to find two columns to subttract from eachother, because every bit of this taunting and teasing from you is not motivational – it feels more like you’re jacking us around. I doubt anyone else looked into this very far either. I think the truth is you really don’t understand that people don’t appreciate it when you play the games you’re playing. You’re doubling down on stupid here with the same attitude. So why aren’t there scores of people writing this up all over the world then? I think you are too lazy to write clearly. Writing is work. It’s very arrogant and aloof of you to act as though it is so beneath you to explain yourself clearly, even after you were asked. If you’d spent a fraction of the time writing something people understood that you spent writing your bi-weekly vague pop-offs in the suggestions pages, this issue would’ve gone places for you. It’s one thing for you to define what your idea is of your own role in things, but your putting on others the role of explaining your ideas and work for you is grossly inappropriate, presumptive, and it only sets up a never-ending cycle of you criticizing people because they didn’t understand you. There will NO follow up on this by anyone because of your gamesmanship with your fellow skeptics. If you had simply laid this out a year ago instead of playing these immature games you’d have accomplished something by now. That’s why you don’t get any respect from me. I know you. You’re going to go to your grave playing this game because it’s what makes you feel superior. There’s a revealing comment from Karl in the article. For the record I note that at this stage ACADEMIA is doing more spearheading on this file than the network of climate “skeptic” blogs, which all appear to be pretending the TOTALLY INSANE assumption of uniformity is ok.
Why would they ignore such a smoking gun and leave all the spoils of victory to academics they hate??? Are you starting to see why I’ve become so suspicious about what’s really going on with wuwt and the intimidating (& corrupting) influence they wield over otherwise-bright, well-intending people like Jo? This issue isn’t going away folks. Get to work on this file. “Skeptic” performance on this file to date has been absolutely ridiculous. Shame! I challenge you and your colleagues to race past the “skeptics” on this file and COMPLETELY outline FORMALLY what is wrong with the uniform IPO-matching ERSSTv4 “bias” “adjustments”. “Skeptics”: PAUSE to consider that you may be very close to humiliating defeat by academia on this file. Imagine how good it’s going to look on them if they admit the mistake and correct it (and history shows that you didn’t even notice it even though it was pointed out to you repeatedly). In all my life I’ve never seen such a clear-cut case of failed justice. This is the sort of thing that undermines human beings’ faith in one another. Leaving this uncorrected is fatal for the integrity of the online climate discussion. This is just classic hilarious. NOAA has a solution for that! They just straighten out the post-(WWII)-step record while balancing the correlation to zero with oppositely-oriented “corrections” before then (which camouflages this systematic “corrections” to automated algorithms). Genius! What’s it going to take to get people to be real and sensible on this file? My guess: DIVINE intervention, no less! At least it has been fun observing how long the train can be off the tracks and people don’t even realize crash is imminent. Adding to the humor, Judy Curry (always challenged with numbers) doesn’t understand where they got 1972! “D’oh!” Look at the graph Judith. The kink is not at 1976. (1976 is halfway up a steep slope!) If you’re looking for help interpreting the stats, you can be sure Judy doesn’t have any of the answers. How can she be so ignorant? Eyes closed? Didn’t look at all?? You see, this is what makes people suspicious about motives — when something is so simple and clear-cut and yet people act like it’s not. It just completely razes trust to zero (and below in cases like this). Josh: Include sickle & hammer on US Dept. of Commerce jersey — make it look like a hockey jersey! Gotta have some fun with this (it’s such a hopelessly depressing chapter otherwise). “Research into the nature and causes of this event has triggered improved understanding of observational biases, radiative forcing and internal variability. This has led to more widespread recognition that modulation by internal variability is large enough to produce a significantly reduced rate of surface temperature increase for a decade or even more — particularly if internal variability is augmented by the externally driven cooling caused by a succession of volcanic eruptions.